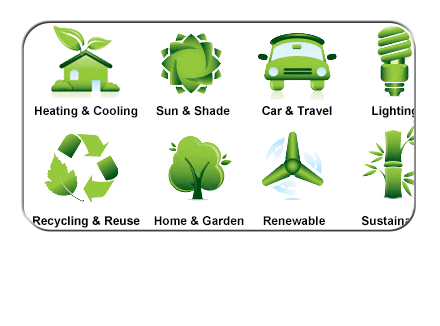 Green Goals provide the structure and empowerment to bridge the environmental concern / action gap. Equipped with simple tools and literacy, participants will gain a sense of agency for integrating green behaviors into daily life. Participation can also lend credibility to the climate change consensus. Join with a buddy; create or find teams. 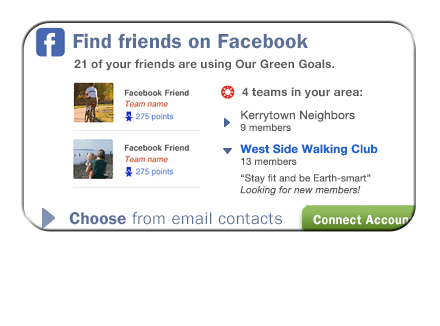 As personal behaviors are linked to existing social networks, going green becomes enjoyable and enduring. Like quitting smoking or losing weight, social marketing tools can be employed to curb carbon-intensive habits. Illustration courtesy of Daniel Tero of Leap In. It’s often the hardest part. 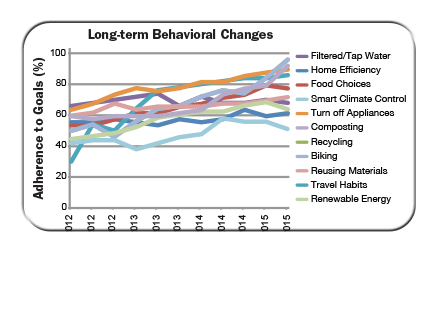 Geared toward green behavior novices, visitors are presented a straightforward and personalized approach toward adopting new habits. By allowing choice and flexibility, participants maintain a sense of control over their commitments, promoting long-term durability. 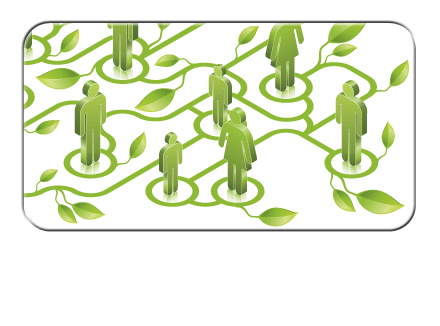 Using social networks, Green Goals will strengthen the idea that green behaviors are socially accepted — and expected. Promoting green behaviors in a socially rich context can generate a positive feedback loop, furthering participant motivation and ownership of green commitments. In contrast, traditional environmental appeals often lead only to sporadic actions based on guilt or concern. Usability is paramount. Providing intrinsic rewards, such as tracking progress and visualizing one’s accomplishments, is one key to the program’s long-term durability. Harnessing principles of stickiness will pave the way to greater widespread adoption of environmentally responsible behavior. Green Goals lead to more active, healthy lifestyles. 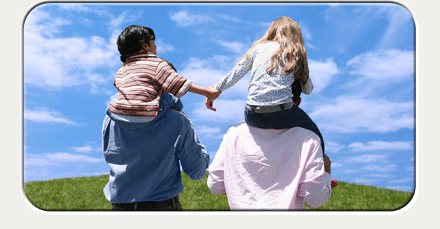 Our program integrates Active Living principles which promotes burning calories, not fossil fuels. 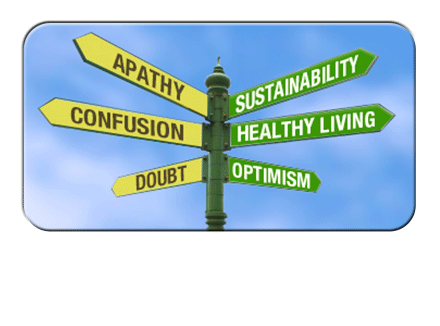 Focus on personal benefits helps make sustainability personally relevant. 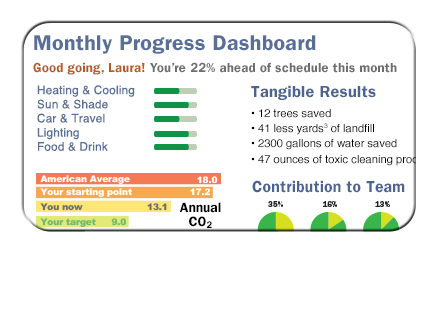 Using principles of Gamification, green behaviors can also be fun. Competition is motivational and enjoyable. Knowing one is making a difference leads to greater long-term adoption. Since the project operates electronically, it can reach many people for years at little added cost. Participant trends can inform environmental community in helpful and specific ways, serving as a model and providing guidance for future efforts that address the behavioral side of climate change mitigation. 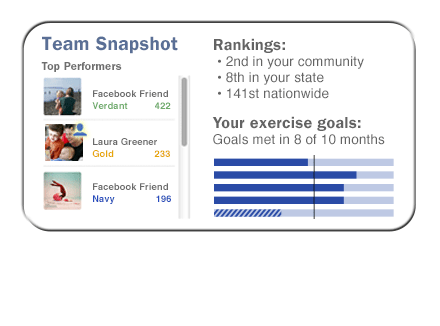 Through online social engagement and team competition, we can support commitments to green behaviors, financial security and personal wellness. Help promote a green tomorrow with your donation today.